Y’all. I went on vacation. Like a real, actual vacation. And it was the first time since 2007 that I’ve been away from the kids and not pregnant. (With the exception of one overnight work trip where I had to pump. So totally doesn’t count.) Anyway, it was awesome. The whole point of the trip was that my mom needed to pick up some things that her mother left for her. My mom’s sister had the boxes in California, but turns out we don’t drive out to California all that often. Like, ever. So this trip was planned specifically to drive out there and pick this stuff up. 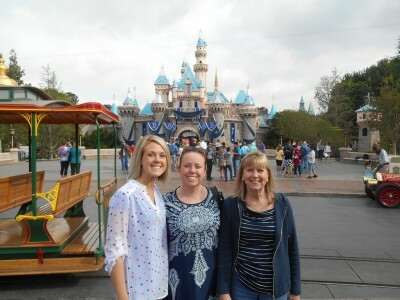 Obviously we also planned lots of visiting with family, and Disneyland, because no trip to southern California is complete without Disneyland. Anyway, since ROAD TRIP! was part of the whole deal, I flew from Kansas City to Denver, where my sisters picked me up (almost 2 hours late after some plane shenanigans in KC) and we continued in Kari’s awesome minivan. We drove to Grand Junction, had lunch and picked up my mom and then drove another 6 hours to St George Utah where we spent the night. That was Sunday, and we figured by staying the night on Sunday we’d miss all the Las Vegas back to California weekend traffic. Except, HA! That now lasts through Monday apparently. My cousins were not at all surprised that we hit traffic on Monday. We stopped in Barstow (I think?) for lunch, along with everybody else in the entire world. Seriously, a whole troop of boy scouts were in line at the same time. So before I bore you to death (TOO LATE!) with details of the trip, how about some pictures? 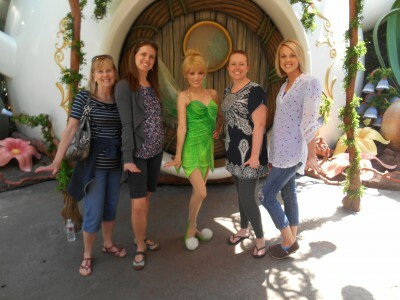 We met Tinkerbell because we didn’t know if Pixie Hollow was a ride or what. (New since the last time we were there.) Apparently it’s where you meet fairies. Also, let me stop here to say that the shirt I’m wearing there? SO comfortable. We went to Ross the day before Disneyland (what, you don’t drive across the country and go to the same stores you have in your hometown?) and I bought that and 2 pairs of cute shoes. ANYWAY. Us with Tinkerbell. 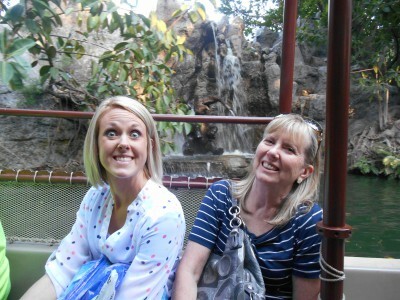 And I just had to include this because it’s the best picture of Kari ever in the history of the universe. And no pictures of the family or friends we visited, because I didn’t ask. I flew home from California instead of driving back, which was good, except it all fell apart at the end because APPARENTLY I left a dome light on in the civic when I parked it at the airport, so Brian had to bring all the kids and come get me anyway. And we couldn’t even get the car jump started, so we had to buy a new car battery and go back again the next day. With all the kids. SO FUN! I need to plan a northern california trip, DEFINITELY.